The golden age of superhero movies is upon us. With “Batman Begins”, “The Dark Knight”, “Iron Man”, “Spider Man”, “Spider Man 2”, “The Incredibles” and “Watchmen” flourishing the genre, it is hard to argue otherwise. The latest addition to the genre is Kenneth Branagh’s “Thor”. Make no mistake there are subgenres within the superhero genre and “Thor” belongs to the same category as “Iron Man” and the “Hellboy” films. It lacks the philosophical themes behind “Watchmen”, the gritty atmosphere of Nolan’s Batman films, and the realism of Shyamalan’s “Unbreakable”, but make no mistake “Thor” seeks neither this nor that. The film succeeds purely through entertainment. Like its subgenre counterparts it relies on the mixture of action sequences, special effects and carefully timed humor. Marvel’s “Thor” universe is based on mythologies of a time when men fought supernatural beings to rise as gods and the film predictably opens with a brief history of two civilizations clashing to get their hands on a powerful glowing stone of some sort. We then get transported to the floating kingdom of Asgard. Meanwhile, the Frost Giants of Jotunheim break the peace treaty by sending a couple of icy villains to steal the stone. Their mission fails and sets off the first act. I’ll do this in keywords, one king, two sons, jealousy, you get the idea. One incident leads to another and before you know it the brothers are off to Jotunheim without the consent of their father or ruling god Odin played by Anthony Hopkins in a role identical to the one he tackled in “Beowulf”. Jotunheim is cold, bleak, dark, silent and empty as you would expect from an evil place. It is right there and then that we learn that our superhero Thor (Chris Hemsworth) has great strength thanks to his giant mystical hammer. We also learn his weakness. 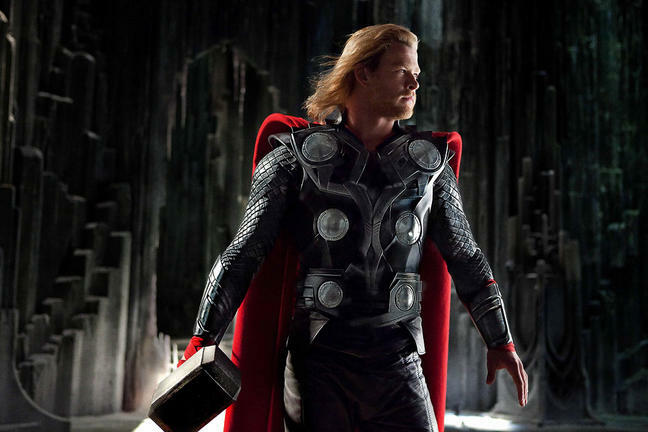 Thor is egotistical, overconfident, and arrogant, in other words he’s full of himself. Naturally, the viewer doesn’t identify with him right away which isn’t an issue for the whole concept is to make room for some character development. The peace is broken and war is declared. Odin sends Thor to Earth to punish him for his weak traits. Meanwhile his evil brother cracks an evil smile and takes over the throne. The second act is where both the character development and humor finds their way into a fairly predictable script. Thor stripped from powers learns to rid his soul from its self-centered flaw. Branagh uses the” former god in a land of equality” concept for comic relief. Thor smashes a mug in a coffee shop and orders “ANOTHER” or walks into a pet store and demands a horse. He also finds love and learns from the innocence of Earthlings. The third act is where all the action breaks loose. I won’t go into details but like I said before the plot unfolds in a predictably. However, this didn’t bother me at all. Predictability works both ways. It can waste the audience’s time with boredom and formulaic scenes or have us anticipate the inevitable; “Thor” fits with the latter. I suspect Branagh knows we know where the story is headed and smoothly leads us to the expected outcome by amusing the audience with one scene after the other. Natalie Portman righteously never tries to overshadow the hero with her strong presence as Thor’s love interest and Tom Hiddleston nails his part as the wicked brother Loki. The S.H.I.E.L.D unit makes another appearance in the genre and a few Stark Industries or Iron Man references are thrown here and there. This also happened in “The Incredible Hulk”, and will likely happen again with the sure to be upcoming blockbuster “Captain America”. The past few years will be looked upon by future generations as the time of great superhero films. Part of the reason is because of the unification of the worlds our beloved super human inhabit. Each film references and acknowledges the presence of the other. It works because like in the original comics the occasional situations of heroes bumping into one another broadens the magical alternative universe we so often tend to visit. I recommend “Thor” to those who were disappointed by “Iron Man 2” expecting the same degree of lighthearted fun of the original film. Sounds like it’s not a must-see, but a good time to be had by all.